Some thoughts - Self Organised Learning Environments - S.O.L.E. Scientists are driven by curiosity, seeking answers to many big questions about the world we live in. Perhaps schools should place a stronger focus on practical learning so when students leave school they are better equipped for the challenges of the real world. "It is a fundamental psychological principle - that choice increases the chance of compliance" - Nigel Latta "the politically correct guide to teenagers." “The real role of leadership in education … is not and should not be command and control. The real role of leadership is "climate control", creating a climate of possibility. This should be evident in all classrooms. The dropout crisis is just the tip of an iceberg. What it doesn't count are all the kids who are in school but being disengaged from it, who don't enjoy it, who don't get any real benefit from it. Stanford psychologist Carol Dweck has written extensively about how we learn and how we make choices. In her book, “Mindset: The New Psychology of Success,” she describes how all of us are born learners who throw ourselves into difficult tasks such as learning to walk and talk - overcoming the inevitable setbacks along the way through grit and persistence. When we have a fixed mindset, failure starts to define who we are - and failure gets transformed from an action (I failed) to an identity (I am a failure). 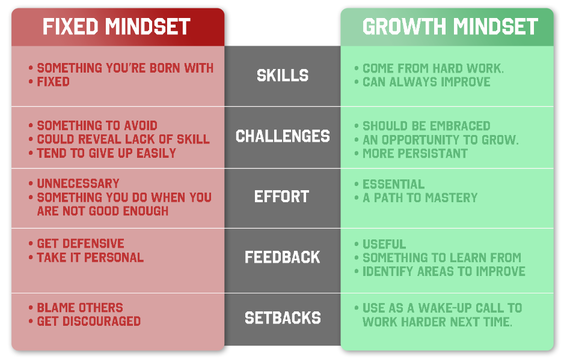 Conversely, those who maintain a growth mindset embrace challenges and use it as a learning opportunity. Setbacks become an opportunity to learn and improve. Rather than being debilitating, failure provides motivation to get better. Mindset also affects our relationships. Dweck finds that growth-minded leaders are not focused on trying to prove they are better than others (a hallmark of the fixed mindset). Rather they work to lift others and create a collective mindset of improvement, innovation, hard work and productivity. In these settings, critical feedback becomes a chance to learn and become more emotionally intelligent. So whether your role is in school leadership or in classroom leadership your mindset will effect every person you engage with - in a positive or a negative manner. It's your choice. Teachers have a captive audience. Unlike many situations in life, students can't vote with their feet if they are not getting what they need. Maybe teachers would benefit from student feedback more regularly. It would be an interesting proposition where the captive audience could provide feedback. In most instances the feedback in classrooms is all one way traffic - teacher to student. In his book “Emotional Intelligence: Why it Can Matter More than I.Q.” Daniel Goleman, a Harvard professor concludes that while intellect (IQ) is certainly a contributor to performance, 90 percent of the difference between average and star performers is attributable to emotional intelligence (EQ) factors. They include self awareness, self regulation (or self discipline) and personal motivation. "EQ competencies also include how we manage our relationships with others, our ability to empathize, skillfully navigate social settings and motivate others through inspiration rather than coercion. Like Dweck’s growth mindset, emotional intelligence can be learned, practiced and strengthened. A similar line of argument for self improvement and self mastery comes from Martin Seligman, a renowned University of Pennsylvania psychologist. Through his exploration of what makes people depressed, he developed a theory of learned helplessness - or a perceived absence of control over the outcome of a bad situation. Over time and in collaboration with others, Seligman began to flip his attention to what made people happy and wrote an important book called “Learned Optimism.” It looks at strategies for developing an optimistic approach to life and contributed to the growth of the positive psychology movement. In his book, “Flourish,” Seligman articulates five elements to his “well-being theory” that include positive emotion, engagement, relationships, meaning and achievement." - Christopher Gergen is CEO of Forward Impact, a fellow in Innovation and Entrepreneurship at Duke University, and author of “Life Entrepreneurs: Ordinary People Creating Extraordinary Lives.” Stephen Martin, a director at the non profit Center for Creative Leadership. The research and findings of Dweck, Goleman, Seligman and others provides some insight on how teachers can use this research to formulate a classroom philosophy and strategies that develop student confidence and a positive outlook in regards to their capacity to learn. We believe that S.O.L.E. is a method that really reflects many aspects of this research.